We do not have a newspaper delivered on Saturdays. Occasionally I will buy the Boston Herald for Glenn. The beginning of November I bought the paper and Glenn noticed an add for a male Lhasa Apso. We checked the phone number and it was the same breeder we got BLAZE from two years ago. I had pretty much resigned myself to just having one dog. Glenn must have wanted the puppy or he would never have shown me the add. He knew I would not waste any time calling Andus, the breeder. There was only one male left so I immediately sent a deposit. Rocko was only three weeks old when I called and this cover photo was taken. We had to wait five more weeks before we could pick him up in Quincy, Mass. It is a good thing I called as soon as I did as Andus said he had fifteen more calls shortly after mine. Rocko was the first male his mother, Noel, had had in five years. It was her last litter and she has since been spayed. Everything just fell into place, as if it were meant to be. We took Blaze with us when we picked Rocko up. We felt it was better if she met him on neutral grounds. Andus wanted to see her also as it had been two years since we picked her up. He thought she was a beautiful Lhasa and loved her hair cut. However Blaze was not allowed in the house as he had two females, the father and little Rocko. He thought a third female might be too much. Blaze never did get to meet the puppy until we got home. I am sure she could smell him in the car. Blaze was in the back of the Outback in her crate and Rocko was on my lap in the back seat after I removed him from the Sherpa bag. We did meet both parents, Noel and Nicki who were very friendly. Noel looks a lot like Blaze. They are the same parents as Blaze, and Rocko is her full brother ! These siblings get along great and they play well together. We watch them every second they are together. Blaze is three times Rocko's size and they play rough. He gives as good as he gets. When he is much larger and Spring comes it will be fun to watch them run around the yard. We had not named the puppy before we met him. Glenn choose the name Rocko and I added the rest. Andus (for the breeder) and Jingle Bell Rock for the Christmas Season. We picked him up on Dec. 17th. In the meantime Blaze and I have been working to improve her heeling. We work almost every day in the basement. Merrillynn Hill, our trainer, suggested putting several cones on the floor in different patterns and heel around them. Sometimes Blaze and I do weaves, serpentines, figure 8's or the Rally spirals. Also straight heeling at long distances around two cones, about turns (left and right), diagonal heeling around different cones on the floor. We do fast, slow and normal paces. Sometimes to music. I have a total of 8 cones I use. Blaze really likes these variations to heeling. She acts as if it is fun and it is. I do a few minutes on leash, then take the leash off. We also use three pvc ring gates to heel around. I set them up in different patterns and can extend or shorten the width for the left and right about turns. The heeling is definitely improving. Not too much sniffing anymore. I rarely use the long - handled wooden spoon with cheese on it to lure her head up. We limit the number of sits as they can become boring. When my neighbor Hilary comes over on Sunday mornings to help me train Blaze, I have her put the cones down on the floor in different patterns. This morning when Hilary came over we did some Rally work for a change. I had Hilary read the Excellent cards and Blaze and I did the exercises. We did the first set on leash and repeated the exercises off leash. We always warm up a bit with a little heeling. Blaze has difficulty with the stand for exam so Hilary was the judge for that today. For some reason Blaze has started to sit on this exercise. Merrillynn suggested I keep Blaze on leash, stand at a close distance to her and help her stand if necessary. Give the "stay" command and keep tension on the leash. Have Hilary or Glenn (sometimes I do it myself) give the exam. Then I return to heel position keeping tension on the leash, pause and move off before she can sit. I have no formal chute to use for the recalls, however it is easy to improvise. I use a couple of the broad jump boards some days. Other days we use several cones. Packages of bottled water will work, etc. The distance between the two sides of the chute should not be much wider than the length of my foot. I had been using a much wider chute so the first time I narrowed the distance between sides, Blaze took a detour around the cones. After a couple more tries with me luring her with a treat she got used to the narrowness. Now we are extending the distance of the recall into the next room. Going through the doorway "threw" Blaze the first try. I vary the exercise by setting Blaze up at different distances and angles (left or right of the shoot). Ring gates may also be used as a chute. Since we got Rocko Blaze seems to be concentrating more on her lessons. Her heeling has improved and her attention is better. This could be because her time with me is now being shared with another dog. Or it could be that she is happy to have a playmate. Fortunately she is crazy about Rocko and he loves her. They are such fun to watch together! Whether it is the first time your dog has been in the ring or the first time in years since you last showed there are important things to remember before entering the ring. My trainer ( Merrillynn Hill) went over some of these reminders at our private lesson on Feb. 23 2017. Blaze and I were entered in Rally Novice on March 2ed in Portland, Maine. The Collie Club of Maine was putting on the show. This was to be the first time in the ring for Blaze. Our lesson was on Thursday and the trainer's first suggestion was to take one day off from training between then and Sunday. The show was on the following Thursday. The second suggestion was for me to have two hands on the leash at all times. This was to give me more control over a small dog. Merrillynn uses the "up here" command to get the dog's attention and to look at the handler, rather than having her nose close to the ground sniffing. Every time I give Blaze a treat I should say "up here" and have her look at me. I prefer to say "Watch" and that works for us. It is a one syllable word and I don't have to hold my hand up for her to look at. She looks at my face instead. I should always be aware of what Blaze is doing, like sniffing and not paying attention. It would be a good idea to get to the show 1 and 1/2 to 2 hours early to give Blaze a chance to look around and have her settle in her crate. She will certainly be interested in all the other dogs, people and different sounds there. Hopefully Blaze will have a chance to sniff around the ring and check it out before any judging begins. I should try to give her three ten minute warm ups before our turn. This will consist of some heeling, about turns, fronts, etc. I must remember not to praise Blaze too exuberantly until we are out of the ring. She tends to bark when she gets excited which praising her does. A judge can deduct one point every time a dog barks. During that last private lesson we also worked on warming up the dog outside the ring, and how to enter the ring properly.I was reminded when to give Blaze her last treat before entering the ring and to make sure she has time to swallow it and not cough it up in the ring. (She has done this in class a couple of times). The following Monday night around dinner time I did not feel quite right - a little light headed. The next morning I was also off balance. Freaking out at this point I called my doctor and got an appt. for later that morning. She diagnosed me with Vertigo, something I had never had before and hope not to again. She sent me home with a prescription for antihistamines. Blaze and I continued to work on our exercises the next couple of days. Thursday morning came and I still did not feel quite right. I thought of the spirals, weaves, 270 degree turns, circles, about turns, figure 8, etc. that might be on our rally course and I opted not to attend. The thought of falling down in the ring was not a pleasant one. Then there is always the thought of the little dog tripping me up (even on a good day). I was very disappointed. The show had a good venue and I like the judge, Tibby Chase. There won't be another show for us before June. Of coures , the next day, Friday, I felt fine and even attended my exercise class. This show was just not meant to be. Maybe it worked out for the best. Blaze is still a baby at 16 months. No point rushing her. This week at home we are doing something different - some dumbbell work, concentrating on the "hold it" part. Blaze is catching on to this a lot faster than she did "take it". The good news is we seem to be making progress with her anxiety and the car. I purchased a dogie car seat from Amazon which allows Blaze to see out the window, face forward in the car, and she is able to see me driving. The combination of the anxiety pill, the Thunder shirt, the drool towel she wears over her head and the car seat seem to be helping. Hopefully we will be able to wean her off the pills and the drool towel eventually. She looks too cute sitting up in that car seat ! Frigid weather and a blizzard coming this week will prevent us from going to any different locations (or anywhere outside the house) for training for another week. Recently my trainer, Merrillynn Hill, suggested I take Blaze to as many different locations as possible before her March 2ed show in Portland, Maine. This is good advice but considering how this month is going (with one snow storm after another) it is next to impossible. I did manage to get Blaze to a local Petco last weekend where one customer pet her and one of the men who worked there got down on the floor and pet Blaze while giving her treats. She needs to have more people touch her, especially men, in preparation for an eventual Stand For Exam. We did have one workman in the house last week and before he left I asked him to please pet Blaze while giving her treats. There are many exercises we work on inside while being house bound. Today we did some heeling and recalls in the hallway. While Glenn cooked Grilled Cheese sandwiches for lunch I put Blaze in both a sit - stay and a down - stay on leash where she could watch him and get the good smells from the stove. This was not only good practice for her but kept Blaze out from under his feet. In our breakfast nook we worked on fronts and finishes. Also "setting up" around a large cone, in preparation for setting up in the ring. A sit -stay with 3 pieces of food on the floor in front of Blaze is a good exercise which does not require much space. Also the Stand For Exam. Some mornings when Blaze is on the grooming table we do a little "take it" work with the dumbbell. 1) Desensitizing Blaze to having her collar touched. She comes into me at such a fast pace on the recalls, I need to grab the collar and slow her down to do the front, otherwise she will run by me. Blaze does not like her collar being grabbed, so we practice having cookies while I touch and hold her collar. This seems to be working. 2) The command "UP Here". I hold a treat in my left hand above Blaze's head and give the command "up here". This is to be used when her nose is to the ground and she is not paying attention to me while heeling. I can also use this command guiding Blaze between exercises and entering the ring gate. It will be very useful when doing Rally as I have guided all my Lhasas with my left hand when doing Rally with them. I just never had a specific command to use before. Blaze already looks up when I say "Up Here." This is an easy command to teach while sitting on the couch with your dog watching tv. We also practice it going through different doorways in the house. 3) When I praise Blaze for doing a good job, I need to do it more quietly. The more excited I sound, the more excited she gets. A judge will not appreciate her barking her head off or jumping up and down in excitement. Last week in class we worked on entering a ring gate. Heeling up one side (several gates set up in a row) and down the other. Then we did weaves in and out of the four gates. Then a "fast" up one side and a "slow" down the other. We also did this variation in heeling around large cones. Learning to "set up" around the first cone, heeling between two other cones at different paces, and circling another cone before finishing at the last one. We tried this off leash (successfully) a couple of times also. M. Hill had us do sit and down stays with a ring gate behind the dogs. The handlers would walk behind the dogs on the other side of the ring gate. It is an excellent idea to get the dogs used to ring gates. Some dogs have a disadvantage of never seeing a ring gate before their first show. In our private lesson the next day with Merrillynn we worked on setting up a course for Rally Novice. Blaze knows all the exercises but she never saw a course laid out. She thought the signs were great for sniffing and tearing out of the holders. I would not want this to happen at her first show ! A couple of the exercises I am still not quite clear on, so I will have to watch a Rally Novice demonstration of all the exercises on the computer. The Spiral can be very confusing and I need to concentrate on that one. M. Hill also said I was making my 360 degree circles left and right much smaller than necessary. I ordered the most up to date Rally Rule Book which needs to be studied! A friend of mine recently surprised me by saying she is through with showing. Her exact words were "There is not enough reward for training my dog and earning titles". I thought working with your dog, thereby creating a strong bond, was reward in itself. I know Blaze enjoys training with me and I love to see her learn more with each training session. Blaze and I had our first private lesson with Merrillynn Hill in almost two months last Thursday. Even though I had been doing some training with Blaze on a daily basis at home, we needed some advise and instruction from our trainer. Blaze was a little distracted at first since she had not been in the training building for awhile. Lots of new smells to sniff. We began our lesson by going over some basics such as : 1). always treat for a "set up". 2). Always give the treat with the left hand, close to your left knee. This should discourage the dog from foraging ahead. 3). Don't practice heeling every day as it is boring for the dog. (Boring for the handler also). 4). Start your heeling with a few "watch me's" and a treat. With off - leash heeling just heel a few steps, halt and treat. Incorporate an about turn, left and right turns, then halt and treat. 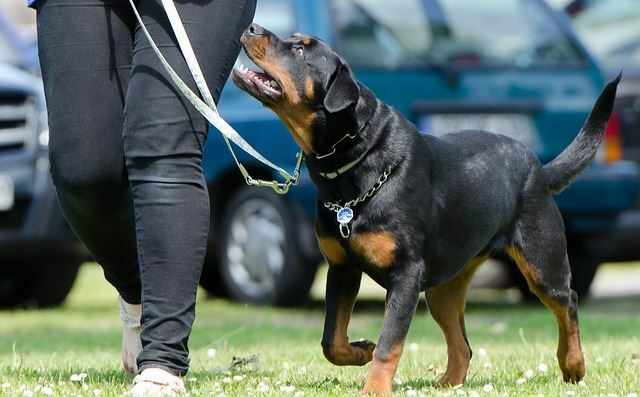 Limit your time on the heeling part of the lesson (no more than 10 minutes) and try to make it fun for the dog. Encourage your dog when she is paying attention and give lots of praise. Merrillynn reviewed the Figure 8 with me and the one important tip I got was to pull back on the leash when going around the turns so Blaze would not get close enough to trip me. On the Recall, after I walked away from Blaze and stood ready to call her to me she would anticipate the command and run to me. She might have jumped the gun by a second, but it could have been enough time to NQ us, or at the very least lose points. Merrillynn's strategy in solving this problem was interesting. Instead of turning to face Blaze, I am to turn sideways, look at her and give the "wait" command. Then walk forward a few steps, turn around and look at Blaze from the side again, continue walking forward, turn around, go back to face the dog and call her to come. By doing this the dog will not anticipate the "come" command. Blaze is pretty solid on the stand for exam, but one important point that Merrillynn stressed is that "It is crucial to have the dog's attention when going from the stand for exam to setting up for the heel off leash." If you don't have their attention before the set up, chances are you won't have it while doing the heeling pattern. It was suggested that I get my feet wet by trying Beginner Novice with Blaze. It would ease me back into showing which I have not done in three years. It would also be a good introduction to shows for Blaze. She does know all the Rally Novice exercises so Beginner Novice would expose her to some Rally signs. When my first obedience Lhasa, BABY MING SQUEEZICKS, CDX. earned his CD title on August 31st ' 91 there was no Beginner Novice title. This optional titling class started in July 2010. Our trainer thought BN might be a good place for Blaze and I to start as it is fun and not as stressful as going for a real title. It would introduce Blaze to a ring and show situation. BN is for handlers who have never shown before, or people like me who have not shown in competition for a long period of time. The day after our lesson I looked up Beginner Novice on the computer and watched some videos which demonstrated the different steps in the title. First of all the judge walks the course with the handlers and explains the different exercises. 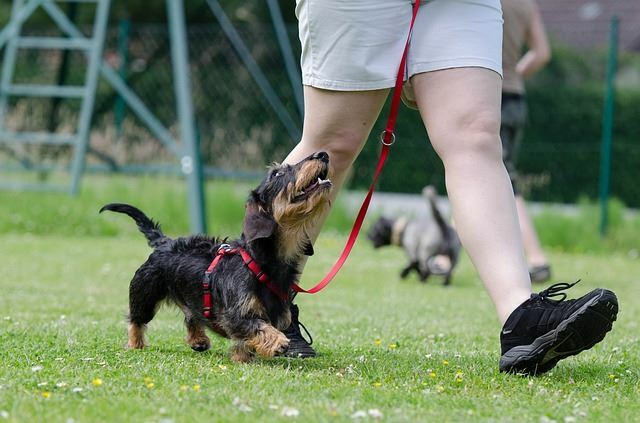 The first exercise is the Heel on Leash which uses Rally signs for the start, finish, fast, slow and normal, left and right and about turns and halt. The halt and sit are at the end of this exercise which is worth 40 points. The second exercise is the Figure 8 which is similar to Novice and Open Obedience. In Novice and BN it is performed on leash. 40 points. The third exercise is the "Sit" For Exam (instead of Stand For Exam). The dog is placed in the center of the ring.The judge approaches the dog from the front and touches the dog's head only. The handler then returns to heel position. This exercise is worth 40 points. The fourth exercise is "Sit Stay - Handler Walks Around Ring". Upon the judges command the handler will place the dog in the center of the ring in a sit - stay position. Then proceed to walk around the perimeter of the ring and return to heel position. The judge will position herself so that the dog and handler are completely visible for the entirety of this exercise. This exercise is worth 40 points. The fifth and last exercise is the "Recall" which begins in the center of the ring. The handler removes the leash from the dog and holds the leash in her hand. Then walks away from the dog to a spot designated by the judge. The dog must come when called and sit close enough in front of the handler that she can touch the dog's head. This is worth 40 points making a total of 200 points. I will find out what shows will be in the NH. - Mass. area this Spring and Summer. Maybe Blaze and I will give BN a try. It would be nice to get Blaze acquainted to showing without a lot of pressure. It would be nice to get me reacquainted to showing without a lot of pressure also. Beginner Novice just might be advantageous to both of us ! August Was Not a Good Month! On August 11th we woke up to Luckee crying in the kitchen at 4 am. I rushed to him and he could not move his legs. Maybe his crying was because of pain or maybe fear. It looked like he had a stroke. Glenn and I tried to make him comfortable: put his favorite blanket under his head and wrapped him in it. Glenn and I took turns with him on the floor, talking to him and petting him. We left two messages at our vet's office. They called back at 8 am. and told us to bring Luckee in at 9 to be put to sleep. We knew there was nothing to be done for our best boy. He had turned 16 years on June 17th and had been declining the last several months. I sat on the couch with Luckee, telling him what a good boy he was and how much Glenn and I loved him. He seemed content to have me hold him and his crying stopped. 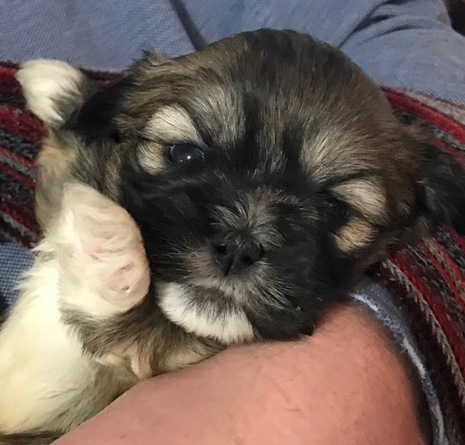 Luckee was the last surviving Lhasa in our last litter of 7. He was the last of our "Moonpye" line and one of our best dogs ever. He was a very even-tempered sweet boy. He knew he was special to me and never took his eyes off me. We had a very special bond. Luckee earned his Companion Dog title at the ALAC National Speciality in Massachusetts in 2002. 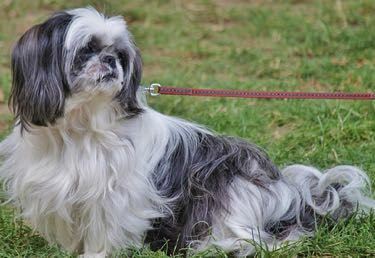 He and his litter mate, Mandi Ming earned first place in Brace at this Speciality. 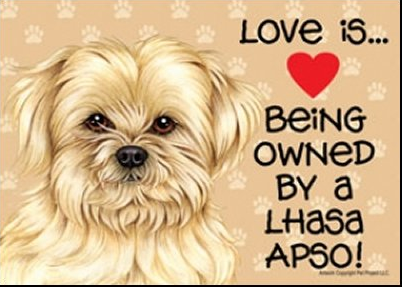 Luckee also had a Canine Good Citizenship title, a Therapy Dog title and was the first Lhasa to earn the RAE title and with a First Place out of 9 other breeds in August ' 09. He was a happy boy, always on the lookout for rabbits in our yard. His tail never stopped wagging. We were very fortunate to have had Luckee as long as we did. He is greatly missed ! On August 29th I was at the exercise gym I had been going to for 4 years. This was my last day. I was not planning to renew my membership. I was using a Bungee Exercise Cord with handles doing stand up rows. The Bungee cord was secured around a piece of stationary equipment. The cord snapped out of the right handle sending me flying backward. I landed on my left wrist, then twisted onto my back which also caused pain. I was right in thinking the wrist was probably broken. The owner of the exercise studio drove me home in my car. My Husband took me immediately to an Urgent Care center where x-rays were taken which showed my wrist was broken and my back strained. The doctor sent me to nearby Exeter Hospital to see an orthopedic surgeon. After seeing my x-rays she strongly recommended surgery as my wrist was not just broken it was crushed. Four days later, on Sept. 2ed, I had surgery on my left wrist. Nine screws and a Titanium plate were put in to hold it together. I had a soft cast up to my elbow for two weeks followed by a shorter velcro cast that I can remove when doing my therapy exercises and bathing. I began physical and occupational therapy twice a week for both the wrist and my back with lots of exercises to do at home also. Little Blaze wants to help me. I have to be real careful she does not jump on my arm in her puppy exuberance! We missed our dog training classes for a month. I did manage to work with her almost every day either on our back deck or in the house. Besides Novice Obedience training we covered most of the exercises through Rally Advanced. When I did go back to my first class, Glenn went with me as I cannot lift Blaze in and out of the car. It is going to be quite awhile before I can do that. Blaze lets me know when she wants to work. She gets into mischief when she is bored and may shred a paper napkin or rip the back off the remote control when she wants attention. One morning she got hold of my velcro cast and was gleefully running around the living room with it. A lot of things are difficult using one hand such as putting a leash on a squirming pup. Holding the leash in the left hand or giving treats with the left hand in class are impossible until I get some mobility back. Brushing her is difficult and trying to get a mat out with one hand is impossible. I couldn't send an article in for last month's issue as I was only typing with one hand. At least now I can type with the left hand also. This week Blaze and I are both taking a training break as she was spayed a few days ago. 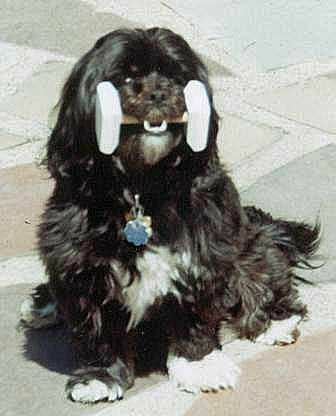 She hates the physical restrictions and most of all the E Collar. (She can lick the incision with the soft round collar so that won't do.) We are both looking forward to getting back to regular classes and some serious training soon. Hopefully entering some shows in the Spring.